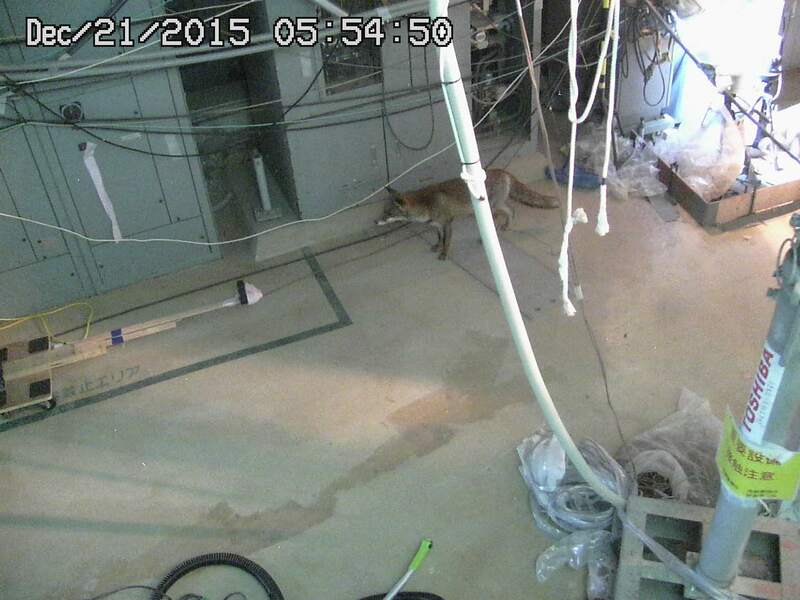 A fox doesn't seem to care if the air dose rate is in several millisieverts per hour inside the Reactor 2 building around containment vessel. I hope the next year is a better year, but since "hope" has been a dirty word for some time now I will just have to prepare. without incident, despite the extremely dense summer fog. Some in Japan had hoped for a failure and disaster (or so they said on Twitter) so that the restart of nuclear power plants would be halted. Sendai Nuclear Power Plant in Kagoshima Prefecture is all cleared for the restart, sometime in July. No effect, no danger, of course. 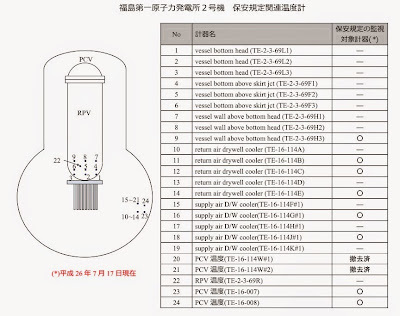 The temperature is either 88 degrees Celsius, or 20 degrees Celsius, depending on which thermocouple you believe. Or none of the above, and both thermocouples are broken. Given the previous history (from 2012 when one thermocouples after another was failing inside the Containment Vessel of Reactor 2), it is possible that both are broken. 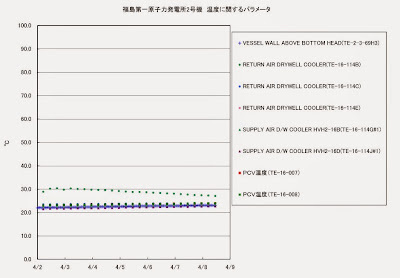 On April 7, TEPCO disclosed that a thermocouple inside the Containment Vessel of Reactor 2 at Fukushima I Nuclear Power Plant showed abnormal temperature. The temperature was 20.9 degrees Celsius at 5AM on April 3 but it rapidly rose to 70 degrees Celsius at 11AM. On 5PM on April 5 it further rose to 88.5 degrees Celsius. Other thermocouples show normal temperatures. TEPCO says "It does not affect the control of the reactor," and is currently investigating. 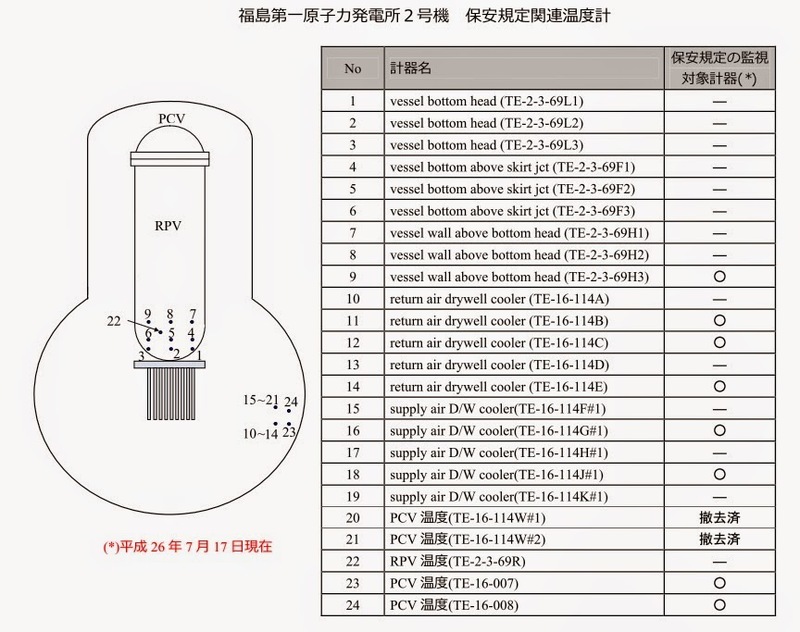 Looking at the chart, it is more likely that this particular thermocouple broke, and the temperature inside the Containment Vessel remains between 20 and 30 degrees Celsius. 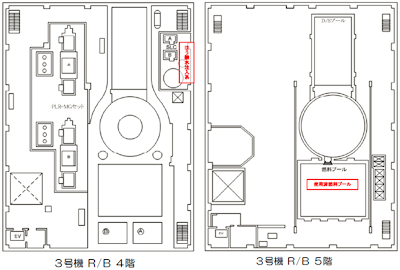 Quickly checking the measuring devices installed inside Reactor 2 (information from TEPCO's site), broken and malfunctioning devices are numerous. As of July 2014, only 8 thermocouples out of 24 inside Reactor 2 Containment Vessel are monitored in accordance with the safety procedures set by regulatory authorities (meaning only 8 are properly functioning), according to TEPCO's information. In contrast, 16 thermocouples out of 21 are functioning properly in Reactor 1 Containment Vessel, and all 19 thermocouples are functioning properly in Reactor 3 Containment Vessel. A reporter and a cameraman from Jiji Tsushin went to Fukushima I Nuclear Power Plant on February 26, 2015 and made the video available on Jiji's site and on Youtube on March 2. So what has changed? Reactor 3's top floor has been cleaned of debris, although the lower floors are still full of debris (1:50). Slightly murky Reactor 4's Spent Fuel Pool on the operating (top) floor is now empty except for a few control rods (3:10); workers had finished removing all 1,535 fuel assemblies from the pool in December last year. The cask used to transport the fuel assemblies from the pool to the common spent fuel pool on the ground is still at the pool side. At about 50 seconds into the video, the reporter and the cameraman go to the location where they can see across the reactors (with Reactor 1 being the closest). The guide, a TEPCO worker, tells them to be brief because the radiation is high and there is nothing to shield the radiation (coming from the reactors?). The guide says, "It's 300 microsieverts/hour." TEPCO's president Hirose just said in his address to TEPCO employees on the anniversary of the earthquake/tsunami/nuclear accident that there are over 7,000 workers working at Fukushima I Nuclear Power Plant. 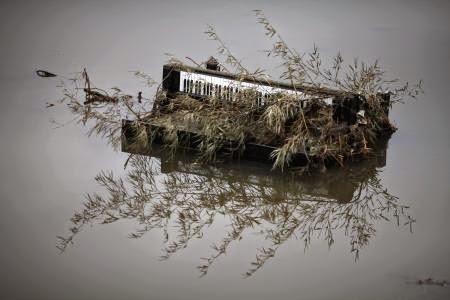 Reuters Japan has a collection of 70 photographs titled "Four Years Ago in Japan". While the nuclear accident that was triggered by the massive earthquake and tsunami on March 11, 2011 has been the focus (often the only focus) for many, the devastation caused by the earthquake and tsunami looks just like a nuclear bomb detonated over Hiroshima and Nagasaki in August 1945, or incendiary bombs dropped on Tokyo on March 10, 1945. 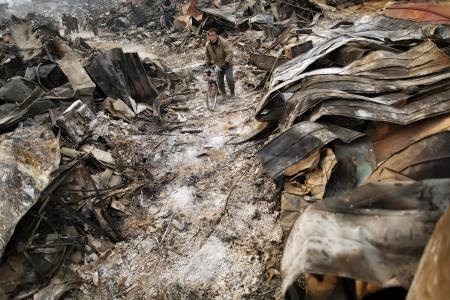 "Smoke rises from houses damaged by an earthquake and tsunami in Sendai, March 12, 2011. 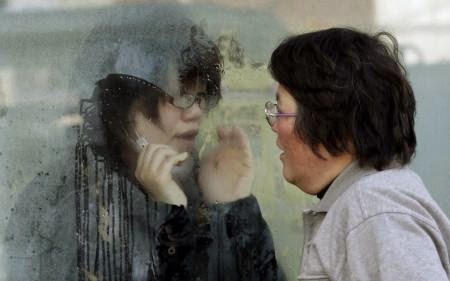 "A mother tries to talk to her daughter who has been isolated for signs of radiation after evacuating from the vicinity of Fukushima"s nuclear plants, at a makeshift facility to screen, cleanse and isolate people with high radiation levels in Nihonmatsu, March 14, 2011. "A piano is submerged in water in the area devastated by tsunami in Rikuzentakat, March 21, 2011. And this, I believe, is near Fukushima I Nuclear Power Plant, right by the ocean. Rows and columns of "fre-con" bags(flexible container bags) stuffed with contaminated soil and debris removed as the result of the government effort to "decontaminate" the villages, towns and cities in Fukushima, temporarily stored outside, right by the ocean. 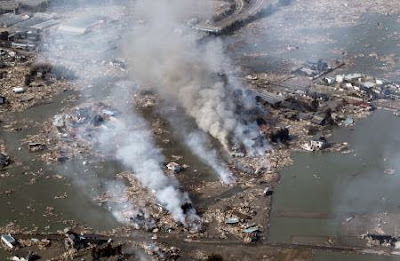 When the earthquake/tsunami hit on March 11, 2011 in northern Japan, they feared the death toll would be in hundreds. Then over 1,000. Then thousands. As of March 10, 2015, 15,891 people are dead, 2,584 missing, 6,152 injured (from wiki, data compiled by National Police Agency). The number for death does not include 3,194 deaths (as of September 30, 2014) after the earthquake and tsunami. Many, particularly the elderly, died of cold and unsanitary conditions at the shelters. 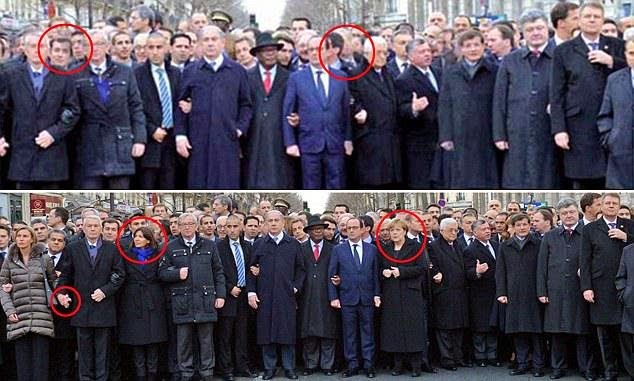 Israeli newspaper HaMevaser photoshopped out Angela Merkel and three other female politicians (including Danish PM famous for selfies with Obama and Cameron), says UK's Independent. 2015 is off to a rocky start. The last week was dominated by events in the French capital where a satirical magazine Charlie Hebdo's editor and cartoonists were gunned down by French citizens who claimed to have taken orders from either Al-Qaeda or ISIS to avenge the Prophet. The cry for "Freedom of Speech" has quickly morphed into the cry from the world governments for more government surveillance of free speech particularly on the Internet, to protect the rest of us plebs from "terrorists", with a quick jab at "racism". Merkl, Hollande, dignitaries from all over the world (including those from countries with dubious records on freedom of speech), arm in arm, looking at... what are they looking at? “Paris is the capital of the world today,” President Francois Hollande told ministers before receiving dignitaries from around the world at the Elysee Palace. “We forcefully noted the need for greater cooperation with Internet companies to guarantee the reporting and removal of illegal content, particularly content that makes apologies for terrorism or promotes violence or hate,” said French Interior Minister Bernard Cazeneuve. US and EU bureaucrats gathered at the French interior ministry to formulate a response to the Islamic State, al-Qaeda and other jihadist groups, many supported, trained and financed by the Gulf emirates, Turkey, western intelligence and the U.S. military. 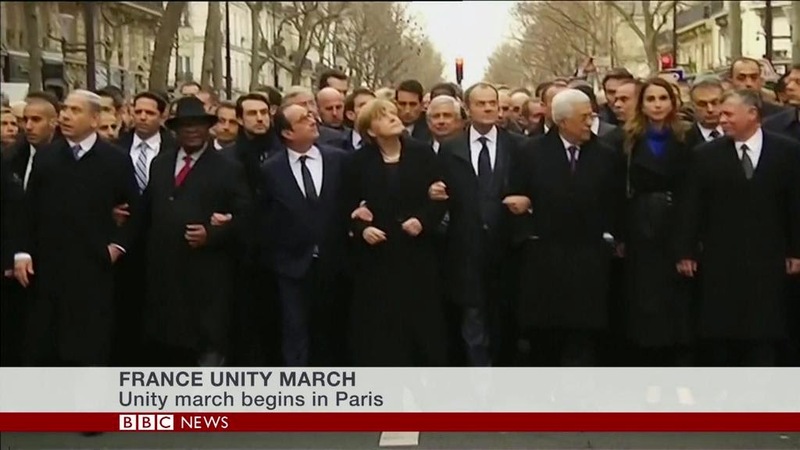 The meeting in France will be followed by a “security summit” to be held in Washington next month. “We will bring together all of our allies to discuss ways in which we can counteract this violent extremism that exists around the world,” said Attorney General Eric Holder. The Paris attack will be used to impose new and more draconian legislation over free speech and the right to communicate without interference by the state. “France’s police state apparatus is one of the continent’s toughest. Article 13 of its 2014-19 defense appropriation legislation permits monitoring, collecting and maintaining Internet user data,” writes Stephen Lendman. The legislation requires ISPs and web sites to provide government with information on users’ activities and authorizes surveillance by the state. Britain, often cited as the incubator for police state activity in the West, leads the way. In 2005 it imposed the Prevention of Terrorism Act which did away with long standing legal protections. The legislation permits arbitrary house arrest, prohibitions against free association, and bans on electronic communication. In September, the British Home Secretary Theresa May criticized Parliament the “torpedoing” of a so-called snooper’s charter communications data bill that would outlaw speech the state considers “poisonous hatred.” May specifically cited the Islamic State when she argued in favor of the the legislation. In addition to addressing the purported threat of Islamic speech, the law would also confront “all forms of extremism‚ including neo-Nazism,” according to The Guardian, and focus on the “culture of bullying and intimidation” in British schools. So they will kill freedom of speech in order to protect freedom of speech. Makes sense in the world in 2015. Ah yes, nursery school teachers in the UK will be asked to "snitch" on small children in their care if they are at risk of becoming terrorists. For Eric Holder, "extremism" in the US is anyone and anything that stands against Obama. Happy New Year. Hope we the plebs all survive. 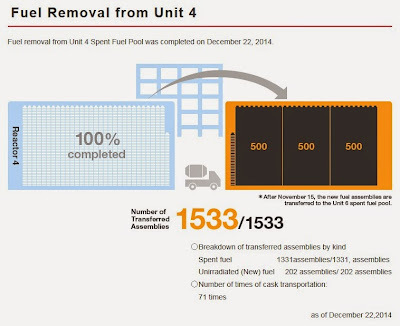 All fuel assemblies - 1331 used and 202 new - in the Spent Fuel Pool of Reactor 4 at Fukushima I Nuclear Power Plant have been moved out of the pool. Most have gone to the Common Pool on the ground level. Some have been moved to the Spent Fuel Pool of Reactor 6, as they ran out of space in the Common Pool. I suppose the purpose of the whole exercise was to placate those who were screaming "End of the world is near!" because "Reactor 4's building would collapse at any moment!" in various parts of the world (particularly North America). Condolences to workers who had to do the actual work and were exposed to large doses of gamma radiation that came from the operating floor of Reactor 3 right next, and from the Reactor 4 spent fuel pool itself due to the high level of cobalt-60 in the water in the Spent Fuel Pool; the water came from the DSP (device storage pool, where Reactor 4's core shroud had been stored temporarily) when the gate to the SFP was damaged in probably one of the aftershocks after the March 11, 2011 big earthquake and let the DSP water flood into the SFP. I wonder if TEPCO ever decontaminated the pool water. Riken finally and very bluntly announced that the experiment to "recreate" STAP cells was a failure. Not even the 31-year-old Dr. (for now, till Waseda University, aka "PhD diploma mills" as many say now, revokes her degree) Haruko Obokata, who claims to have created the so-called STAP cells more than 200 times, couldn't do it, not even once. DNA analysis proved that Obokata's novel "STAP" cells were nothing but ES (embryonic stem) cells already known and widely used by reseachers. Riken also concluded that there was NO EVIDENCE that Obokata had actually done the experiments that were reported in the Nature paper and letter. Everything, most likely, was made up. Outright fraud. I wonder if Harvard University is doing any investigation. After all, the Vacanti (of Vacanti-mouse fame) lab is where Obokata learned the trick. However, Riken very generously exonerated Obokata by saying they couldn't identify who "mixed in" ES cells more than 200 times. It is unlikely that there was accidental contamination by three different ES cells, and it is suspected that the contamination may have occurred artificially. However, given the difficulty of identifying who might have contaminated the cultures, it is not possible to conclusively determine that it was artificial contamination. We cannot, therefore, conclude that there was research misconduct in this instance. Obokata was allowed to quietly resign. It's good to be very well connected, I suppose, having Prime Minister and Minister of Education as fans. The US and the West propaganda of Russia being the cause of all ills in the world notwithstanding, this one doesn't seem like being caused by Russia. There is a media report that the largest nuclear power plant in Ukraine and in Europe (and 5th largest in the world) may have a radioactive leak. The source of this news is RT, which has unfortunately not been that reliable when it comes to news about the Fukushima nuclear accident. RT quotes LifeNews that reports leaked official report. A radioactive leak has been detected at Ukraine’s Zaporozhye Nuclear Power Plant, the largest in Europe, a media report says, citing the country’s emergency services. Ukrainian officials have denied the report. LifeNews published what it claims is a leaked report by the State Emergency Service of Ukraine, which denies an earlier assessment by the plant’s authorities that the radiation at the facility is equal to the natural background following an incident on Sunday. RT is trying to verify the report. Ukrainian authorities have denied the Russian media report that a radioactive leak had taken place at the plant, Reuters reported. "The plant works normally, there have been no accidents," an energy ministry official told the news agency. No official comment on whether the leaked documents are authentic has been provided. Two documents released by LifeNews appear to show that the plant's officials put deliberately misleading information on their website. The documents – both addressed to the head of the regional emergency services – state that radiation levels at the plant on Sunday and Monday were 16.8 times higher than the legally permitted norm. By Monday, the levels had slightly increased – growing from 16.3 to 16.8 times higher, and Unit 6 was still shut down, the report said, contradicting the plant's statements that the problem had been fixed and that the plant was operating normally. The article also says that the US Westinghouse (Toshiba) will "significantly increase fuel deliveries to Ukrainian nuclear power plants through 2020". Good luck Ukrainians, if what Russia's Sputnik news agency has been tweeting is true. Nuclear energy experts and officials have repeatedly warned the Ukrainian authorities that it would be unsafe to use US-made fuel in reactors of Soviet and Russian design. District Court Dismisses Lawsuit from Family of Worker Who Died At #Fukushima NPP, "No Evidence TEPCO Was Supervising the Work"
and therefore is not responsible for the worker's death. Then who was supposed to be supervising the work? Is the judge saying the worker was working at Fukushima I Nuclear Power Plant in May of 2011 just because he felt like it? The judge also exonerates four layers of subcontractors likewise, and adds that the plant operator (TEPCO) and main contractors do not have obligation to ensure worker safety. Who was supposed to ensure safety, then? Japan's judiciary is notorious for overwhelmingly siding with the authority and large corporations, but this seems to be going overboard. The worker, Mr. Nobukatsu Osumi, died of a heart attack on May 14, 2011, the very first contract worker to die while working at Fukushima I Nuclear Power Plant. He was hired by the fourth-tier subcontractor. Shizuoka District Court (presiding judge Yuji Murano) rejected the liability claim against four companies including TEPCO and Toshiba totaling 30.8 million yen [US$257,000] in the death of Mr. Nobukatsu Osumi (age 60 at the time of death) who had been sent to Fukushima I Nuclear Power Plant by a subcontractor and died of a heart attack on the job. The suit alleged that TEPCO and the subcontractors were negligent in ensuring safety. Judge Murano acknowledged that "There is no evidence that the four companies including TEPCO were actually directing and supervising the worker." He concluded that "For the orderer of the contract [TEPCO] and prime contractors [Toshiba and others], there is no obligation to ensure safety." According to the judgment, Mr. Osumi worked as a worker for the 4th-tier subcontractor from May 13, 2011, laying pipes for the plant restoration work for which TEPCO had contracted Toshiba and IHI among others. He became ill all of a sudden in the early morning of May 14, 2011 and died. In the press conference after the judgment, Mr. Osumi's wife who is a Thai national said "TEPCO doesn't even offer one incense stick [i.e. offer a single prayer for the deceased]. Such a dry judgement." She plans to appeal on December 26. If I remember right, Mr. Osumi's work was for AREVA's decontamination/co-precipitation system. 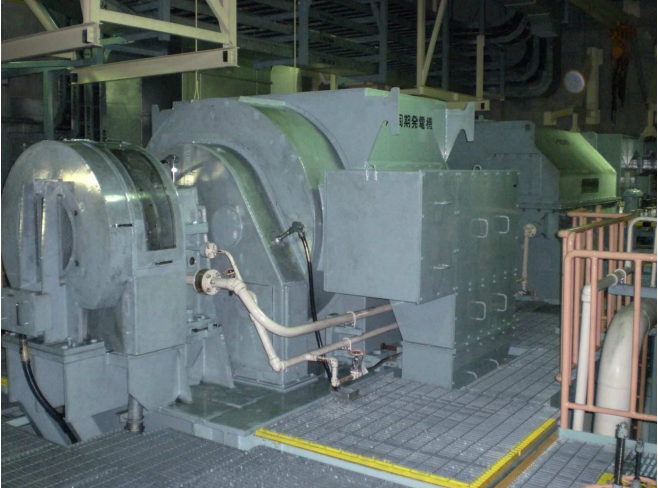 TEPCO has long stopped using the system, due to extreme contamination of the system as well as sub-par performance. 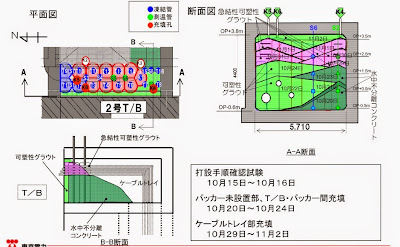 As to be so expected and anticipated by this blog's readers, no doubt, TEPCO's Plan D for plugging the trenches leading from Reactor 2's turbine building is not succeeding, if not an outright failure. TEPCO says water flow is still detected, but the flow is very minute (as in "400 liter/hour" minute). I'll post later. 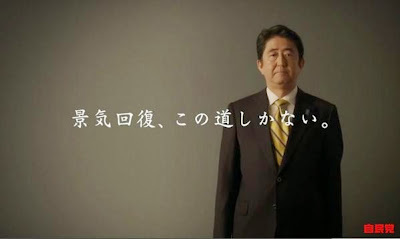 (OT) Abe's Just-In-Case Election - "This Is The Only Way"
Japan's Prime Minister Abe called a snap election without a cause, other than to make sure, just in case, his party LDP and coalition partner Komei Party still has popular support to carry out so-called Abenomics. 3. LDP alone will surpass 300 seats. 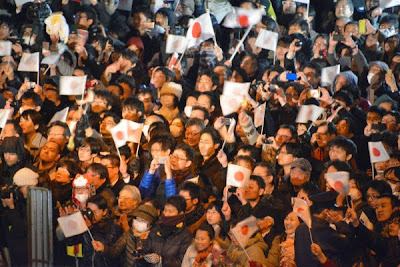 Angry voters in the small world of social media (like Twitter) doesn't seem to translate into real-world angry voters who will vote against LDP/Komei over abysmal real-world Abenomics accomplishments (higher stock market, lower yen, lower wages, more contract workers, negative GDP growth, etc. etc.) or over Abe's peculiar idea of "Beautiful Nation Japan" by changing the Constitution and removing "fundamental human rights" references. "For Economic Recovery, This Is the Only Way"
So the madman Haruhiko Kuroda at Bank of Japan will keep printing increasingly worthless yen to boost the stock market even further, as Abe's ministers having handsomely benefitted from the rising Nikkei. His ministers, particularly Finance Minister Aso, would point out the Nikkei index and say, as if it should be so self-evident to anyone, "See, Abenomics is working. The stock market is rising." For his part, Abe will restart nuclear power plants, export arms, invite Las Vegas casinos, curtail citizens' rights for the greater good for his "Beautiful Nation". If the ruling coalition wins two-third majority, he may try to amend the Constitution by national referendum. 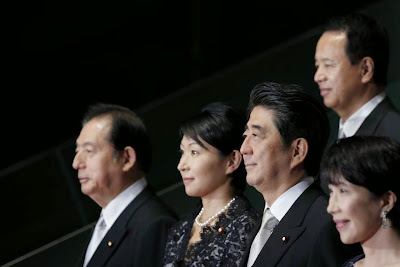 LDP already has the draft, and it makes a very scary reading unless you are Abe believer. The only thing I have noticed different this time around, compared to the last election (Upper House), is that more net citizens look more determined to vote for the opposition, EVEN IF THEY DON'T LIKE THE OPPOSITION. Because they detest LDP/Komei more, many are willing to hold their noses and vote for the opposition candidates, whatever the party. 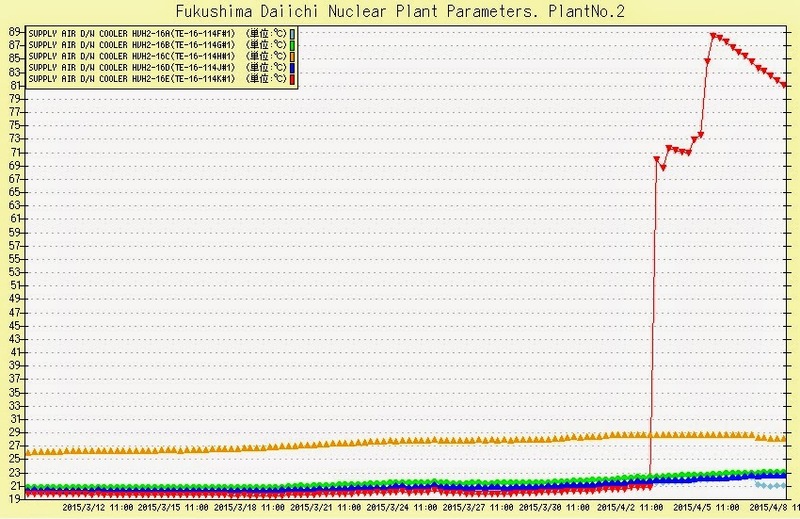 #Fukushima I NPP: Plan C Also Failed in Plugging Reactor 2 Trench... Now What? But first, recall that Plan A was to install freezing pipes at the head of the trench leading from Reactor 2 turbine building to create an ice plug so that the extremely contaminated water that had been sitting in the trench since the very beginning of the nuclear accident could be pumped out. TEPCO started the work in April this year. That failed. The ice plug didn't quite form. Then recall that Plan B was to dump tons (literally) of ice and dry ice in the trench near the freezing pipes to lower the temperature of the water around the freezing pipes so that the ice plug would finally form. Workers dumped ice all day and all night, in the high ambient radiation right at the trench. That was in hot August. 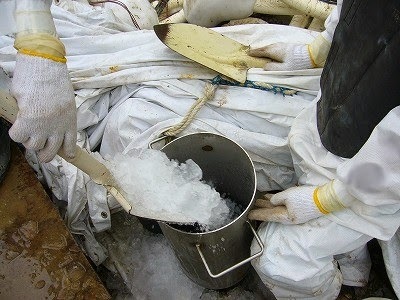 Try to freeze the trench with ice in hot August. That also failed. Dry ice clogged the pipe, and the ice plug didn't quite form, and TEPCO admitted there was water still coming into the trench from the turbine building. The water sitting in the turbine building comes from the reactor building after it cools the molten core somewhere in the building, and it is warm. So TEPCO came up with Plan C.
What was Plan C? It was to fill the gap between the incomplete ice plug and the turbine building wall with fillers. TEPCO chose the combination of grout and concrete. A plug of ice, grout and concrete was formed. Sort of. That failed, just as I predicted. TEPCO finally admitted on November 17 that it was a failure after pumping out some 200 tonnes of this highly contaminated water on November 17 and seeing that the water level in the trench didn't go down as much as they had calculated. The water was still coming in from the turbine building, and the groundwater was probably seeping in. But not to worry. TEPCO has Plan D, and it has been already approved by Nuclear Regulation Authority. So what is Plan D? To fill the trench with cement while pumping out the water that gets displaced (in theory) by the cement. 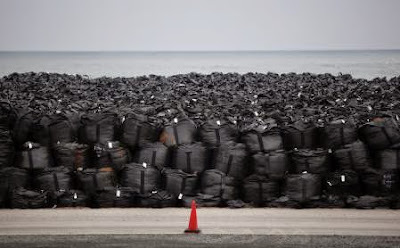 An effort to stop contaminated water from flowing into a trench at the crippled Fukushima No. 1 Nuclear Power Plant failed to completely halt the flow, announced Tokyo Electric Power Co. (TEPCO), the plant's operator, on Nov. 17. A TEPCO representative said, "We believe we have not completely stopped the water. Groundwater may also be entering the trench. We will closely analyze the changes in water level in the trench." TEPCO says that when around 200 tons of contaminated water was removed from the trench, the water level in the trench should have fallen by around 80 centimeters if the point of leakage between the plant's No. 2 reactor turbine building and the trench had been fully sealed. However, the water level only fell by 21 centimeters, so TEPCO determined that the leak must be continuing. 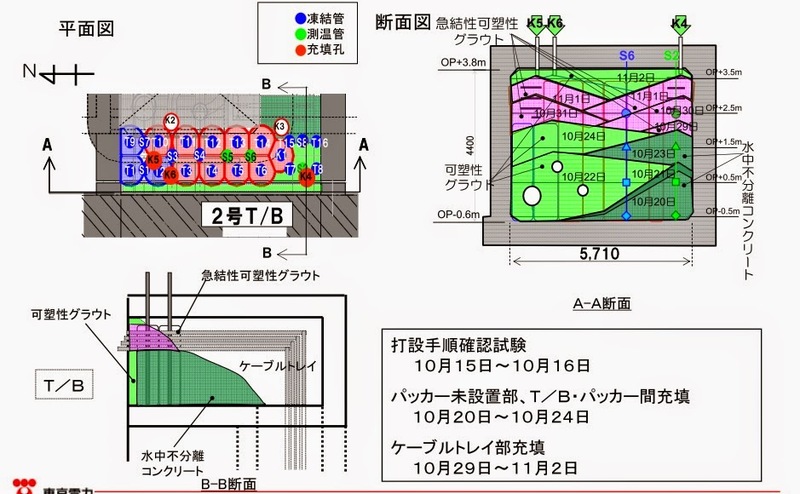 ...While the water remains in the trench, TEPCO cannot create a planned underground wall of frozen soil around the No. 1 through 4 reactor buildings to stop water leakages. 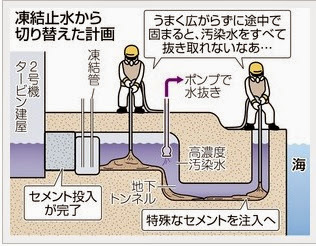 (TEPCO) will propose (to Nuclear Regulation Authority) a new method of plugging the trench by pouring in the special cement that spread thin and wide in the water while removing the contaminated water in the trench gradually. 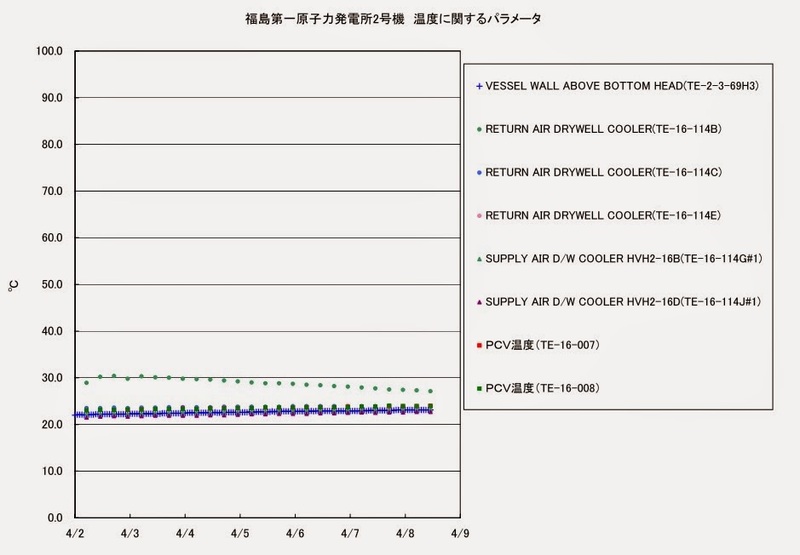 TEPCO says in the document (page 9) they submitted to NRA that it will be a mixture of cement, fly ash and underwater-inseparable admixtures (セメント、フライアッシュおよび水中不分離混和剤などの配合調整). They will use the tremie concrete placement method. The NRA meeting on November 21, 2014 was funny without participants intending to be funny, from what I read in the tweets by people watching the meeting. At one point, Commissioner Fuketa exasperatedly asked TEPCO representatives, "So what was the point of trying to freeze the water? Was freezing even necessary at all?" The answer was no. TEPCO's Shirai admitted (according to the tweet by @jaikoman on 11/21/2014) that there was a talk inside TEPCO that the ice plug was not necessary. So why did they do it, and why did NRA approve it? No one knows and no one is held accountable, while workers had to set up freezing pipes, then to pour ice, dry ice, grout, concrete, and to pump this highly contaminated water over the past 8 months in high radiation exposure. TEPCO hasn't disclosed the radiation exposure for the workers. It's not that there isn't any more news about the Fukushima I NPP accident or about the Japanese politics or about anything I want to write about. There are plenty. But since this summer I have had to take care of my health problems (nothing major but nonetheless needing attention) while at the same time doing whatever I can to make ends meet, and I simply have not had a decent enough chunk of time to research and write a post. I'm a slow writer and it often takes several hours to write a single post. A quick thank-you to people who have kindly donated to this blog since late last year and whom I have failed to thank in person. I'm not doing this for money, but it helps me keep going. Thank you. Special thanks to S.L. in Vienna, Austria, who has regularly donated a generous amount for over three and a half years now, from the very beginning of the Fukushima nuclear accident. And thank you everyone who come to my blog to read my posts. I'll be back soon. For those who do Twitter, I manage to tweet (as it is short) articles, comments. But those are not limited to the nuclear accident, and most of them are in Japanese (I'm trying to tweet in both Japanese and English). My English-speaking followers must be very frustrated. You could follow me @exskf. 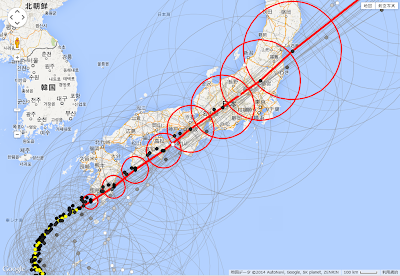 It is expected to land in Kagoshima Prefecture in Kyushu in the morning of October 13, 2014, then zap through Shikoku, Kansai, Chubu, Kanto, southern Tohoku, in a pretty much straight line. 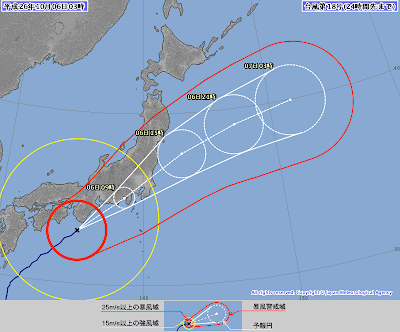 (UPDATE) The landfall is likely to be Hamamatsu City in Shizuoka Prefecture. JMA reports the current location of the typhoon to be SSW 70 kilometers from Hamamatsu City. It is likely to be a "direct" hit in East Japan. 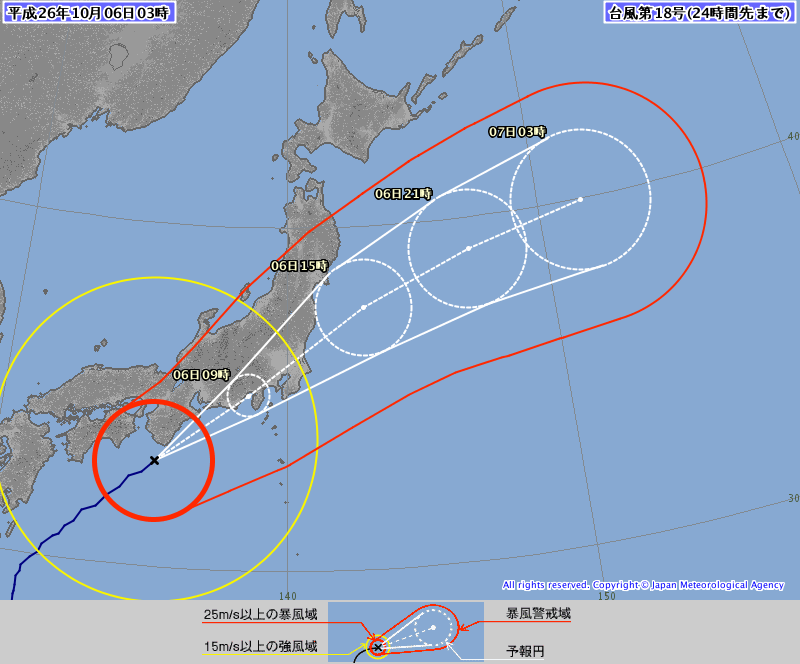 Usually, a typhoon that hit East Japan and Kanto will have made a landfall earlier in West Japan, thereby its destructive wind and rain reduced by the time it hits East Japan. Not so this time. East Japan, particularly Kanto, is not well-prepared for a direct hit. The statue of the god, 国之常立神（"god that always stands on the land"）, on top of Mt. Ontake is still standing, but without the head. The photo was taken by Mainichi Shinbun, shared on Twitter by @Santou. I thought this was rather symbolic. So far, 51 people are (finally) confirmed dead. There are still 15 people missing. From what I have read in the newspapers, there may have been people who may have been alive if they had been rescued earlier. But it seems to be "safety first" and foremost for the rescue workers including fire fighters and Self Defense Force, from the start. The maximum density of hydrogen sulfide deemed safe by the government law (Industrial Safety and Health Law) is 10 ppm. Not so for the fire fighters, who decided to be very safe and use 5 ppm as the max they would tolerate. Not so for the Self Defense Force, who decided to be even safer than the fire fighters and use the ridiculously low 1 ppm. So, they evacuated from the mountain when their finely tuned instrument showed the density to be slightly over 2 ppm. There is something that doesn't make sense about the rescue effort by the national government and the local municipalities. (OT: UPDATED) Mt. Ontake in Nagano Prefecture Erupts, 250 Climbers Trapped Near the Top, More Than 30 "Dead"
(UPDATE-4) Another word that the government agencies and mainstream news outlets are at great pains, for some unknown reason, to avoid is "pyroclastic flow". Government officials are busy denying that's what happened in Mt. Ontake. Volcanologists on Japanese Twitter are laughing at them, though. 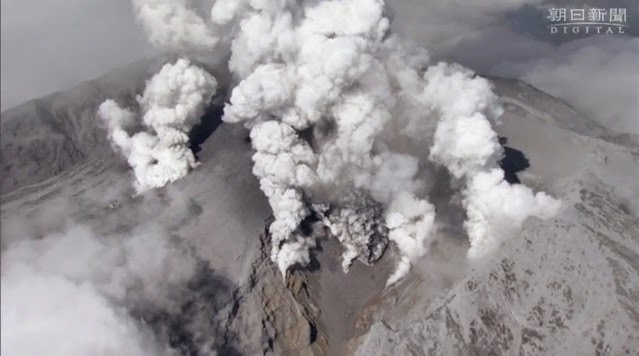 (UPDATE-3) Asahi (9/28/2014) special alert quotes Nagano Prefectural Police saying there are over 30 people on the summit who are "in a state of cardiopulmonary arrest" (i.e. most likely dead). (UPDATE-2) NHK today (9/28/2014) is saying there are more than 10 people on the summit who are "not moving" and "in a state of cardiopulmonary arrest". 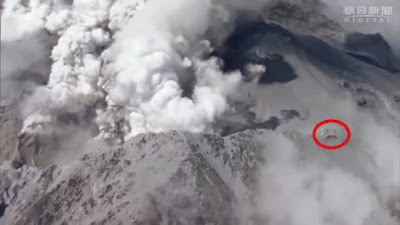 Not moving, not breathing, heart not beating, but NHK and other mass media are so afraid for some reason to say the word "dead", so as not to hurt the feeling of the family members of the "not moving, not breathing, heart not beating" climbers lying in the volcanic ashes, supposedly. (UPDATE) Kyodo News quotes Nagano Prefectural Police saying 8 people have been seriously injured, and 7 of them are unconscious. There may be deaths. 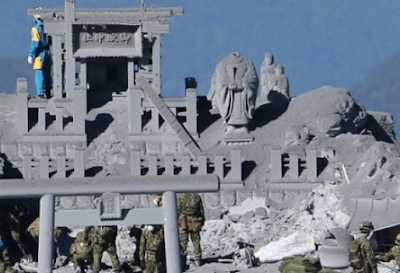 Jiji Tsushin (9/27/2014) reports that 8 people were injured with one person severely injured, and that there are about 250 people trapped near the mountain top. Jiji also mentions an unconfirmed report that 4 people are buried in the ashes, and one has been rescued. There has been a series of small earthquakes in Nagano Prefecture in the past week. I find it interesting that Jiji's news is under the "Great Eastern Japan Disaster" (March 11, 2011 earthquake and tsunami) section. 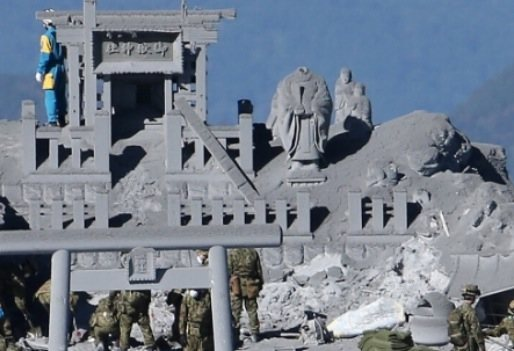 No doubt in relation to Sendai Nuclear Power Plant in Kyushu, which has been cleared to resume operation despite a huge volcanic eruption risk nearby. The one who started it (who also happens to be one of the Nobel Peace Prize winners) didn't even have a courtesy to inform us first, but now, according to Reuters columnist Jack Shafer, it is "our war" now. I happened on this column as translated into Japanese at Reuters' Japanese site, and looked for the English original at Reuters. I have no idea whether the column has been read widely or how many retweets it has gotten. My guess is not widely read and few retweets, as it is a depressing read (except for those with ties to the defense industry, I suppose). War without end: The U.S. may still be fighting in Syria in 2024, 2034, 2044 . . . This must be what perpetual war looks like. In a Pentagon briefing yesterday, Army Lieutenant General Bill Mayville called the cruise missiles and bombs flung at targets in Syria “the beginning of a credible and sustainable persistent campaign.” How long will the campaign last? “I would think of it in terms of years,” Mayville responded. Although the bombs exploded on Syrian soil, they didn’t target Bashar al-Assad’s battered, murderous regime. The bombs were addressed to Syria’s enemy, the Islamic State, a nascent nation that has pledged to topple both Iraq and Syria, as well as Lebanon, Jordan, Israel, Cyprus, and parts of southern Turkey, and erect a caliphate on the parcel. But in attacking Syria’s enemy, the United States wasn’t looking to make friends with Syria. President Barack Obama called for Assad to step down in 2011, and it was only last year that the United States was prepared to bomb Syria for having crossed the chemical-weapons “red line” to kill its own citizens. Not that the United States is remarkably choosey about which nations it counts among its allies. Among the Middle East nations joining with the United States to strike Syria is Qatar, which has allowed one of its sheikhs to raise funds for an Al Qaeda affiliate in Syria. As you know, the United States is at war with Al Qaeda in all of its flavors, including the Syria-based Khorasan Group, upon which U.S. bombs fell this week. The Khorasan Group is said to be plotting attacks on the United States and Europe. Our perpetual war is complicated, however, by the fact that the Islamic State is the sworn enemy of Al Qaeda, from which it split earlier this year because it couldn’t play nice with Al Qaeda’s other affiliate in Syria, Jabhat al-Nusra, which is also fighting the Assad regime. Or, to look at it another way, the enemies of America’s enemies are not automatically America’s friends; and even America’s friends, which can be permissive about the flow of money to Al Qaeda, aren’t necessarily America’s friends either. America has allies in Syria’s civil war, of course, including Harakat Hazm, part of the Free Syrian Army. Harakat Hazm is fighting Assad, but it has also fought alongside America’s enemy Jabhat al-Nusra, which has not disqualified it from receiving U.S. weapons and training. Harakat Hazm took exception to the American-led bombing of Syria in a statement, calling it an “external intervention” and “an attack on the revolution,” according to a Los Angeles Times report. So Harakat Hazm, America’s friend, which fought with America’s enemy against Syria—which is neither friend nor enemy—objects to the fact that America bombed Syria in pursuit of the Islamic State, which is also Harakat Hazm’s enemy. Meanwhile, the militant Shiite group Hezbollah is drone-bombing Jabat al-Nusrat along the Lebanon-Syria border at the same time Israel is downing Syrian jets. Confused yet? You’ll have plenty of time to catch up. As Mayville promised, this conflict will likely go on for years. It’s a wild card war in which allies and enemies seem arbitrary and ever-shifting. Will the American attacks strengthen the Assad regime by weakening the Islamic State, as some speculate? Or will it drive Jabhat al-Nusra closer to the Islamic State, at least in the interim? Or will the American-funded “moderates” shake off their masters and place Assad in their gun sights instead of the Islamic State? National security reporter Thomas E. Ricks, a man not subject to confusion, can’t decide whether to call the latest hostilities a new installment of a new Thirty Years’ War (1991-2021?) or another chapter in the War of the End of the Ottoman Empire (1914-2040?). A war with a conclusion that its participants can’t see or can’t imagine is a war without end. None of the dig-in parties in Syria and Iraq look like pushovers, but neither do any of them look like sure bets. Without American intervention, the current war will likely rage on. With regard to American intervention, not even the Pentagon dares to predict an end. For Americans, at least so far, this war is rumbling on like background noise. The usual markers of military victory—body-counts tabulated, territories seized and banked, no-fly zones established, governments-in-waiting imposed, and elections supervised—don’t apply to the Syria war. The borders, combatants, allegiances, and military objectives in the Syrian war are too fluid to conform to our usual expectations. Nor do the usual markers of peace seem to exist. There are no peace talks taking shape, no shuttle diplomacy, no evidence of a dominant power about to exert its might to create a lasting peace by flattening everybody. In hypothesizing a 30-year-long war, I fear that Tom Ricks was off by a factor of two or three. In bombing Syria, President Obama, who inherited this war, has made this war his war, the next president’s war, and our war. Today, tomorrow, and for as far as the eye can see. Perpetual war for perpetual peace. Combine this perpetual war for perpetual peace with Ebola scare (the disease is supposedly now out of control, thanks to oh-so-competent (not) WHO and UN), and we have FEAR hanging over us perpetually. "Naturally the common people don't want war: Neither in Russia, nor in England, nor for that matter in Germany. That is understood. But, after all, IT IS THE LEADERS of the country who determine the policy and it is always a simple matter to drag the people along, whether it is a democracy, or a fascist dictatorship, or a parliament, or a communist dictatorship. Voice or no voice, the people can always be brought to the bidding of the leaders. That is easy. All you have to do is TELL THEM THEY ARE BEING ATTACKED, and denounce the peacemakers for lack of patriotism and exposing the country to danger. IT WORKS THE SAME IN ANY COUNTRY." I happened on this 25-minute video in TEPCO's video archive (Japanese), instead of the usual Photos and Videos Library. There is no document explaining the purpose of the video or the findings from the video. 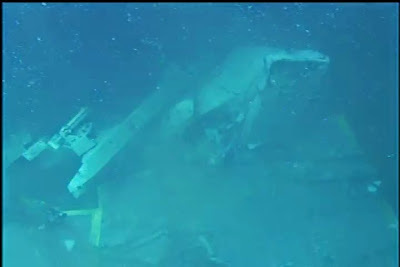 In the video, the section that is covered with metal sheets is where the Spent Fuel Pool is. TEPCO plans to construct a structure over the Reactor 3 building to install the crane and the fuel handling machine to remove the spent fuel assemblies. This video survey is probably related to the plan, to assess the structural integrity of the section in order to build the structure around the building. Or so I thought at first, until I remembered a togetter I read in August. What was beneath the operating floor in the northwest section? "koajisashi" reminds us in the togetter of the March 23, 2011 fire in the Reactor 3 building, with black smoke seen rising vigorously (see my post on 3/23/2011; TEPCO called it "gray smoke"). At that time, the exact location of the fire was not reported, and the time and date when the fire started was not known (or reported) either. 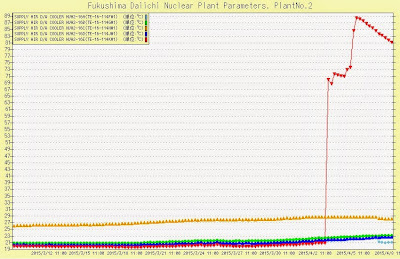 Black smoke was seen rising from the Reactor 3 building on and off until the evening of March 23, 2011. At 11PM last night [3/23/2011], conducted visual survey and thermography measurement and concluded that the burning had subsided. The cause of the black smoke is considered to be the MG set [PLR-MG] beneath the operating floor. SFP is about 2 meters away from [part of] the MG set. As there was a worry about deterioration of the SFP wall strength due to the heat generated when the black smoke was rising, we evaluated the data. The SFP wall is 185cm (about 6 feet) in thickness, made of reinforced concrete. The reinforcing bars closest to the surface of the wall are at 8 centimeters from the surface. The reinforcing bars start to be affected by heat at 300 to 400 degrees Celsius. According to the fire-resistance data by the [relevant] scientific society [no mention of which one], it would take about 4 hours [of burning] for the temperature to reach 350 degrees Celsius, and we concluded there would be no major effect on the strength of the SFP wall. As I wrote above, no one knows exactly how long the MG was burning. In fact, the same NISA meeting report, on March 23, 2011, says the black smoke started to gush out at 4:20PM on March 23, 2011, and as of 9:30 the black smoke was still rising. So the fire may have been burning for at least 5 hours on March 23, 2011. The news, if the details like these had been reported by the media at that time, should have made people very nervous. 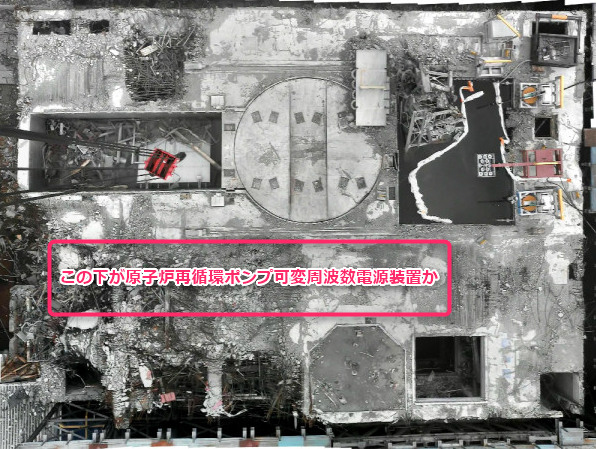 And this is probably why TEPCO video-surveyed the area in detail, and also why TEPCO seems very eager to remove the spent fuel assemblies from the Reactor 3 Spent Fuel Pool, despite the mess and damage of the Reactor 3 building. The structural integrity, not of the northwest section per se, but of the Spent Fuel Pool itself, may be the issue that concerns TEPCO. 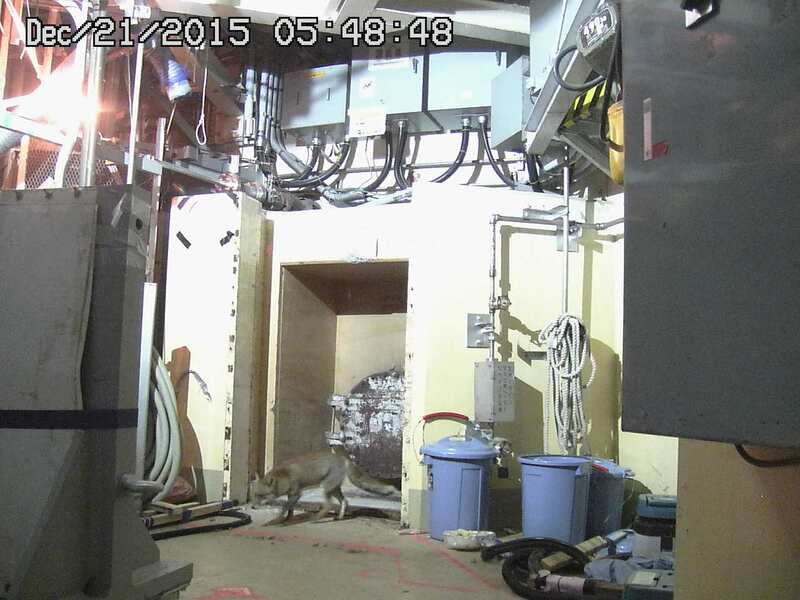 Or rather, workers employed by the general contractor Kajima, manipulating the crane from a remote location using cameras, dropped the console into the Reactor 3 Spent Fuel Pool. TEPCO started removing debris from the Reactor 3 Spent Fuel Pool in December 2013, and the removal of the Fuel Handling Machine started in May 2014. I sure hope there are more cameras that are available to the workers to better control the crane and awkward attachments to cut and grab debris. Inside the pool, the spent fuel assemblies are now covered with sheets to protect them from accidental or unintended dropping of debris. TEPCO says there was no change observed in radiation monitoring. dutifully parroting her boss, PM Shinzo Abe. Thanks to the recent cabinet reshuffle by PM Shinzo Abe, Ms. Yuko Obuchi (link in Japanese) became the Minister of one of the most powerful ministries in Japan, Ministry of Economy, Trade and Industry (METI), at an extremely young age (for the Japanese politics) of 40. She is the daughter of the former LDP Prime Minister Keizo Obuchi who died in 2000. Right after his death, Ms. Obuchi "inherited" her father's constituency and was elected to the Lower House at the age of 26. So far, she has already pledged to restart nuclear power plants in Japan by "making safety our priority." She visited Fukushima I Nuclear Power Plant on September 7, and gave us her expert assessment of the situation. Minister of Economy Obuchi says contaminated water at Fukushima I Nuke Plant "is under control"
Minister of Economy, Trade and Industry Yuko Obuchi visited Fukushima I Nuclear Power Plant for the first time since her appointment. She spoke with the reporters after the visit, and answered the question of whether the problem of contaminated water was under control. She said, "Overall, I think the situation is controlled." Minister Obuchi said "individual incidents continue to happen, but looking at the result of the monitoring, the effect of radioactive materials inside the plant harbor is completely blocked." One year ago at the International Olympics Committee in Buenos Aires, Prime Minister Shinzo Abe made a speech for the 2020 Tokyo Olympics and said the contaminated water at Fukushima I Nuclear Power Plant was "under control." Ms. Obuchi, who became the Minister of Economy on September 3, thus follows the official view on one of the top priorities for the Abe administration. The effect of radioactive materials is blocked, not radioactive materials themselves. Whatever that means. The approval rating of the Abe administration jumped as much as 10 points after the cabinet reshuttle. 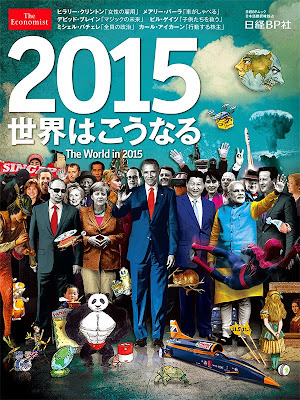 Ostensible reasons include a number of female ministers, including Ms. Obuchi, as if it is a good thing. Taro Yamamoto, who won the seat in the Upper House on his appeal to anti-nuclear, anti-contamination voters, has an astute observation (link in Japanese) about the Abe administration doing something to boost popularlity and the possibility of Abe dissolving the Lower House and calling a snap election in fall. Yamamoto thinks that may be the only way that the Abe administration can gloss over the failure of "Abenomics" and survive. He says LDP and Komei may be the only parties with enough organization and money to prepare for an election with very short notice. I think he may be right. I for one just cannot imagine Ms. Obuchi controlling (or pretending to control) the bureaucrats in the most powerful ministry, or overseeing (and pretending to control) TEPCO in the decommissioning of Fukushima I Nuclear Power Plant. I think she (and other female ministers) are for show, to boost the popularity of the Abe administration in preparation for a snap election soon.